So, I e-mail the 1st half of my mystery manuscript to a certain publisher for him to take a look at. With any luck, I will be published next year. Thinking about this while straightening my hair this morning made me think of the beginning of my writing asperations. I first wanted to become a writer in Miss. Murphy's second grade class. My first ever story was about my cat Rainbow. After this I wrote stories about my school in a black and white composition book. I changed all the names of course (I knew about libel at a young age somehow) and they all pretty much ended in some one being converted to Christianity in a way that John Wesley would die for. I think my writing got muddled for a while after I spent a couple years reading Sandra Cisneros and Julia Alveraz. I thought hispanic writing ought to look a certain way, so I tried to immitate it. 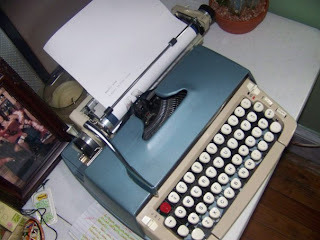 This is also around the time my father found this 1932 Corona typewriter and gave it to me for my 10 birthday. I wrote 4 pretty amazing stories about Maria, Jesus and Theresa living in Spanish Harlem. These are the only stories I like from this era of my writing. And yes, Maria and Jesus are Mary and Jesus. They make a special appearance and convert Theresa's family. I swear some times I should have been a Catholic. Next up comes stories filled with teen angst. I think its because when I was 12 and 1/2 my grandfather died and then there were all kinds of family drama. My writing reflects that in an amplified way. Characters were being pushed down stairs, disowned, abandoned in diners full of wilting flowers... Actually, I wrote a pretty good stage play from all this. I used The Godfather as a template but the story is entirely my own. Its about a man who marries the wrong woman. Very dramatic. After this my stories died down a bit, and I spent almost all of college writing poetry. I wrote one story, OK two, but my heart wasn't in them. Then I got into mysteries. Enough said. It rained for all of ten minutes about two hours ago and my sister and I were right in the middle of it. We ran all the way from our front door to the truck, and boy were we soaked. Then we went to 7-11 and became even soaked-er. By the time we reached the house and our room we were a sopping mess. Which reminded me of Jane Austen's book Sense and Sensibility. The part where the girl played by Kate Winslet (and her eyebrows) gets caught in the rain and has to stay at the eligible bachelor's house? Ok, so I didn't read this book, but I do own the movie. In fact I hate Pride and Predjudice. I never read Persuasion, Northanger Abbey or Mansfield Park. I did read Emma though. I love that book, the BBC verson AND the 1995 movie "Clueless." Anyway, I just wanted to post and update saying I'm glad to be in the house reading "A Walk with Jane Austen: A Journey into Adventure, Love & Faith" by Lori Smith. I'm thinking of my summer plans. I'm so excited to be doing something different. And don't worry, I do plan to write while I'm in NJ.